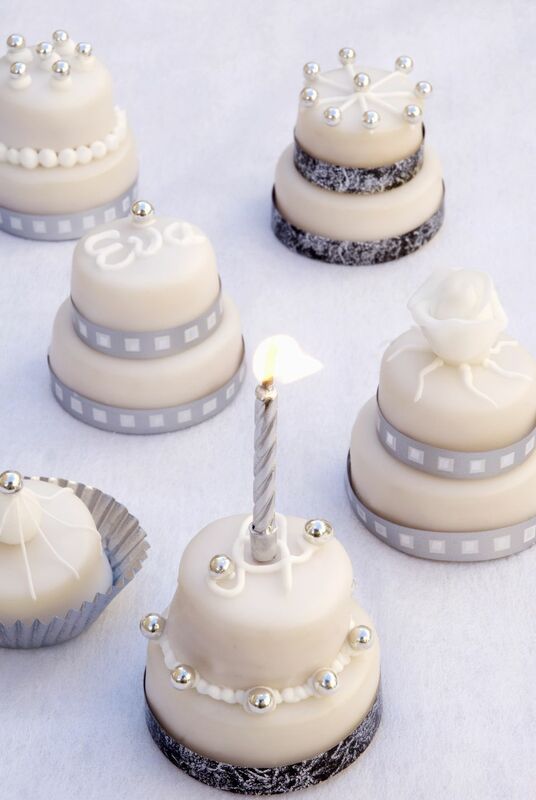 Fondant Pearls add a beautiful decorative touch to any cake or pastry. To make fondant pearls, fondant is rolled into balls and dusted with luster dust to make realistic, glimmering edible pearls. You can use either homemade or storebought fondant. If you prefer to make it yourself, Basic Fondant or Marshmallow Fondant are both good options. You can also make pearls out of other moldable candy pastes, like marzipan or chocolate plastic. Be sure to check out the step-by-step photo guide showing how to make fondant pearls. Begin by kneading the fondant until it is smooth and supple. The amount of fondant you use depends on how many pearls you require, and the size of the pearls you make. It’s always a good idea to be generous in your estimate of how much fondant you need, but I am often surprised at how many small pearls I can get out of even a quarter pound of fondant. Lightly dust your workstation with corn starch or powdered sugar, and roll out the fondant until it is about ¼ inch thick. Use a piping tip to cut discs out of the fondant. For small pearls, use a tip with an opening of 1/4” to 1/2” wide. For larger pearls, use the bottom of a small or large tip to create much larger circles. After you have cut a number of circles, roll them one by one between your palms to form balls. If you don’t have piping tips you can always just pinch off bits of fondant and roll that into balls, but the beauty of cutting out circles is that it produces pearls that are all very close in size. At this point, the balls can be stored in an airtight container or bag for weeks or even months before they’re needed. When you are ready to finish you pearls, pour some luster dust into a container that can be sealed, like a Tupperware container. Add a small amount of clear alcohol or alcohol-based extract, just enough to turn the luster dust into a shimmering liquid. Working in batches if necessary, add the pearls, being sure to leave plenty of room in the container. Cover the container with a lid, and shake the pearls around until they’re coated with the luster dust. Pour the finished pearls onto a baking sheet covered with waxed paper or parchment, and repeat until all of the pearls are coated and shiny, adding more dust and liquid as needed. Once dry, the pearls can be used to decorate your cake, cupcakes, or pastry.